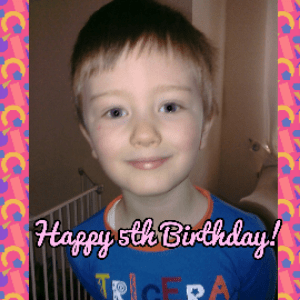 Happy 5th birthday to my (not so) wee man! I can’t believe Jack is 5 years old today, he is growing up way to fast, he starts primary school in 2 months time. The last 5 years have been very up and down, with me feeling like I lost out on his first 3 years due to post natal and the last 2 with the arrivals of Max and Lucy. My wee boy is growing up into a proper wee boy, he is no longer a wee toddler. He finishes up nursery in 4 weeks time and takes the big step into primary school. Part of me feels he is ready and I can’t wait for him to start, but other times I see him as this wee boy and unsure of how he will be. We tried to give him as best a birthday as we could this year, with our limited money, and I think he’s enjoyed it. 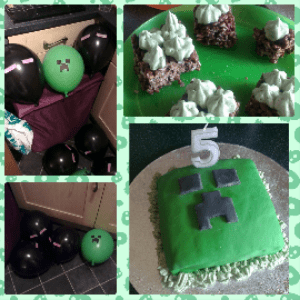 We did a semi-minecraft theme, decorated balloons to look like endermen and creepers and our cake n well that didn’t turn out quite so well but we were up until almost midnight baking it! All in all it turned out pretty good, and I have one very tired and happy boy away off to sleep.